BMW’s first-ever “green” drop-top, the i8 Roadster, is ready to roll onto the scene of Singapore at the upcoming BMW World 2018 — eight years after it was originally revealed as a concept car. Peek into the plug-in hybrid convertible from August 25-26 at the Suntec Singapore International Convention and Exhibition Centre. According to the car specs, you can stow the fabric-roof, which folds into a Z-shape, within a swift 15-second timeframe, making the BMW i8 Roadster the quickest to drop its top — and raise it again — across all the company’s models. All-electric operation ensures the roof opens or closes in an almost silent hush, even on the move at up to 50km/h. The car’s overall construction also utilises plenty of innovative production technology. For example, there are 3D-printed parts made of aluminium elements that link the roof with the body of the car. And because of its soft-top make-up, the car seats strictly two — unlike i8’s sports coupe, which do offer rear seats albeit being quite tight. However, the loss of backseats for the Roadster means it gets a little more storage space and increased boot capacity. The car also gets to keep those jaw-dropping butterfly-wing doors we love. A 1.5–litre, three-cylinder engine powers the i8, producing peak torque of 320Nm and a max output of 228bhp; while an electric unit for the front wheels adds a further 141bhp, taking the total to 396bhp. This means the car can go from 0-100km/h in just 4.6 seconds. Electric-only speed has been increased to more than 50km, at speeds up to 105km/h. 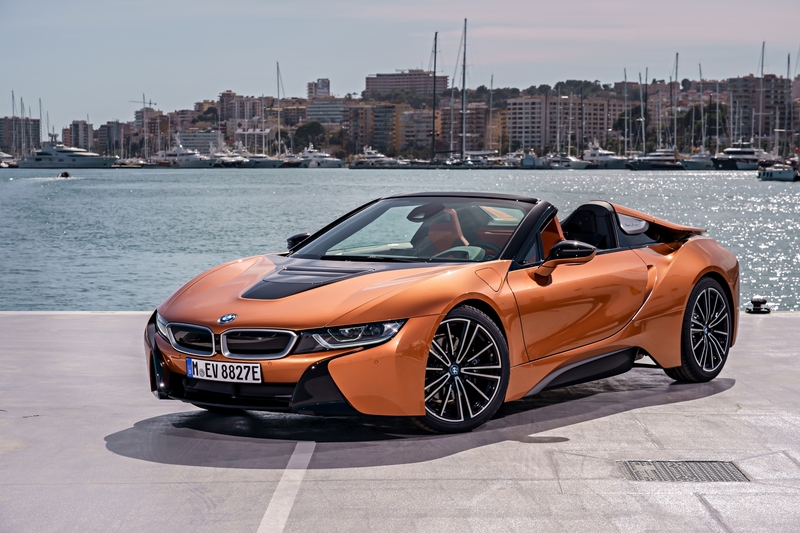 At the BMW World 2018, you can not only get up close and personal with the BMW i8 Roadster but also other new and limited-edition models, including the BMW 8 Series, BMW M2 Competition as well as the quirky Designer Mini by Paul Smith. There’s also a sneak peek of the marque’s make that aims to expand its luxury automotive line-up: The BMW Concept X7 iPerformance. The concept car, first unveiled in Frankfurt last year, is set to be BMW’s flagship SUV.